Playing sports offers more to a child than trophies and goals. But some parents seems to forget the true meaning of sports. That was my father’s mantra when my brothers and I played middle-and high-school sports. Sure, he loved it when we won, but he had smiles and encouraging words for us even in a loss. For today’s kids, playing sports presents opportunities and motivations that were not around when I was a kid. Has winning become the only goal? Athletes love to win and they hate to lose, says Patrick Cohn, sports psychology expert and owner of peaksports.com. Parents also delight in seeing their child win. But sports, Cohn says, offers much more to a child. “There are so many life skills that can come through the sports experience, especially if it’s a positive one,” Cohn says. Kids pick up skills such as leadership, motivation, determination, focus and a better ability to cope with everyday life from sports. But sometimes, says sports and exercise psychologist Keith Kaufman, parents have ulterior motives for watching their kids play sports. “A lot of times parents get excited, thinking a scholarship could be down the road. Especially if a child is talented, it starts to become what a sport can do for the family and less about the activity itself and the fun it brings,” Kaufman says. Mark Wiggins, a teacher at Positive Coaching Alliance, agrees. Too much control can have a negative effect on young athletes. The two longtime coaches of Proactive Coaching have worked with young athletes for decades. Bruce Brown and Rob Miller always ask their players about the worst and the best memory of playing sports. So it seems my Dad was right all along. It’s not whether you win or lose; it is how you play the game that counts. 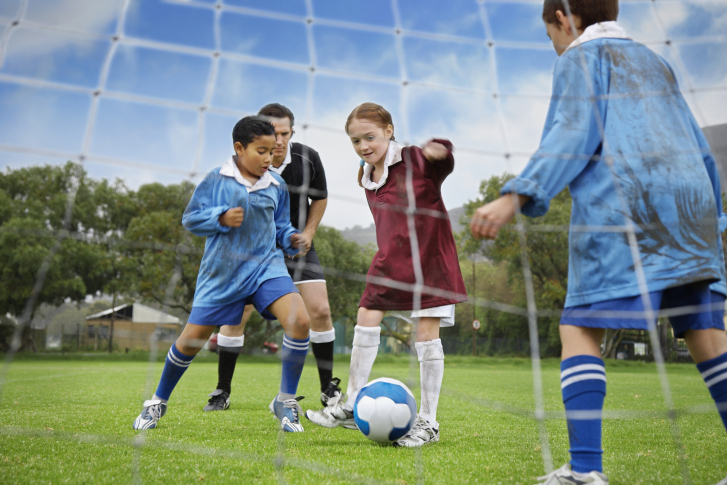 What behavior do you witness at your kids’ sports games? Let us know in the comments section of this story, on Twitter or on the WTOP Facebook page. Until then, a local parent shares his take on being a good sport. My son’s soccer team had a grand total of four practices that weren’t cancelled by our strange weather this year. My daughter never made it to any of her soccer practices; she’s getting ready for a ballet recital at the end of the month. Practice doesn’t really matter much. At their age, they just tear around the field like really confused bumblebees. They kick the ball; they kick the opposing player; they kick their own teammate. And sometimes, they just miss the ball completely and/or fall on the ball itself. They steal the ball from their own teammate and occasionally kick the ball the wrong way. It’s hard enough keeping calm when you’re watching from the sideline. It’s even harder when you’re the assistant coach, as I was for my son’s team. We’re supposed to be encouraging good sportsmanship and skill development at this age — not developing prima donnas. The kids don’t buy it, though. They want to score and beat the other team by 20 goals. We’re obviously sending mixed messages at home versus on the field. On one hand, we want the kids to excel — to play well and be gracious when the other team does well. I believe in that. It’s important to learn how to play and how to comport yourself on the field. On the other hand, we want them to go for the jugular and whip the other team soundly. I’m sure we secretly hope that our kids have that soccer scholarship wrapped up by middle school. I love watching my kid play. He’s not the most talented kid out there, but he hustles; he has fun; he scores; he plays good defense. I’ve seen him tumble to the ground and pop up running. I want him to learn that it doesn’t matter how many goals he scores; it’s a team sport — learn to have fun. I tell him that the score doesn’t count. Be a good sport; congratulate the other team when they do well. I want to encourage and model these ideals when I’m out there coaching. Editor’s Note: Marc Parsont has been a practicing massage therapist since 1995. He has his own massage practice in Alexandria, Va. He is married with two young children, a nanny and a rescue pooch named Daisy. Marc started blogging about being a former stay-at-home dad and a parent almost three years ago now. He likes to cook and eat what he cooked, watch bad television, read science fiction and practice being a contrarian. Marc received a degree in journalism from American University, worked for three hotel chains and ran a top 200 trade show. He speaks French, grows weeds in his garden, throws (and catches) boomerangs and thinks he’s funny, much to his wife’s chagrin.